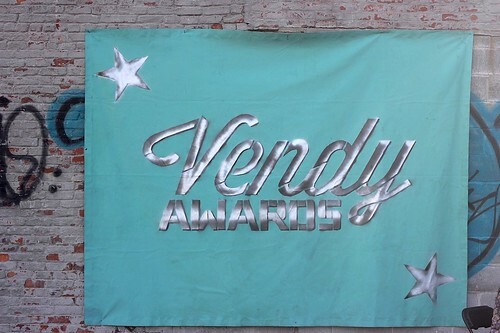 Sunset Park’s Industry City hosted the ninth annual Vendy Awards this past Saturday. Twenty-eight vendors converged to battle over seven different categories, and of course various members of your ML crew were there recuperating from Street Meat Palooza with more street meat. 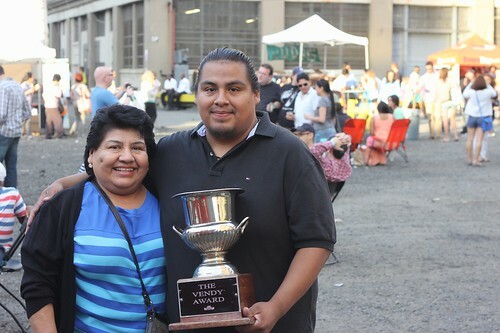 2012 Vendy Cup winner Eleazar Perez of Red Hook’s Piaztlan Authentic Mexican Food was on hand enjoying her last few minutes as the reigning Vendy queen, and to cheer on fellow Red Hook vendor, El Olomega. 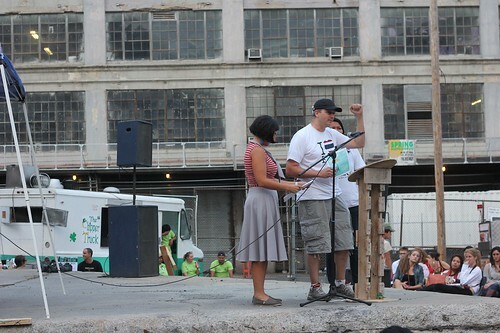 Part of the day’s ceremony went to applauding the post-Sandy efforts of over fifty vendors. Together, they mobilized and served over 350,000 meals to the most severely affected neighborhoods in the days following the storm. The Market Vendor Award came back for a second year with finalists Bon Chovie, Brooklyn Cured, Lonestar Taco, Porchetta, and the ultimate winners: Khao Man Gai NY. Emorn & Eric Henshaw served up their authentic Thai street food dish–it’s basically chicken over rice, but obviously so much more as it won over the day’s audience. 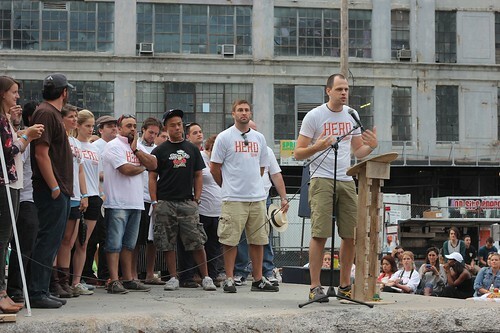 One of the day’s longest lines was found at Tony Baloney’s Mustache Mobile, one of the Best of New Jersey finalists. 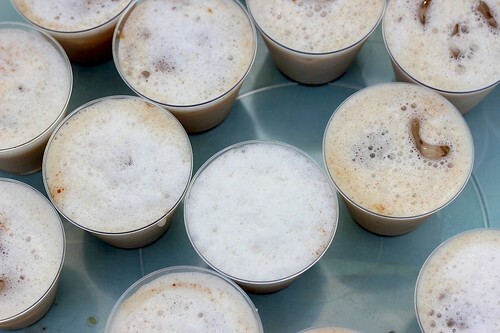 His tikka pizza and cheesesteak were up against cajun classics from The French Quarter, this iced coffee and a healthy sandwich from Molly’s Milk Truck, Hunger Construction, and the category’s winner: Home by the Range (who also took home Tide’s Messy Yet Tasty Award). Rookie was a tough category this year! Lebanese from Toum, Thainamese from Sweet Chili, Pizza from Neapolitan Express, Mysttik Masaala‘s Indian, and Mamek’s Malaysian all lost out to Nuchas‘ empanadas. 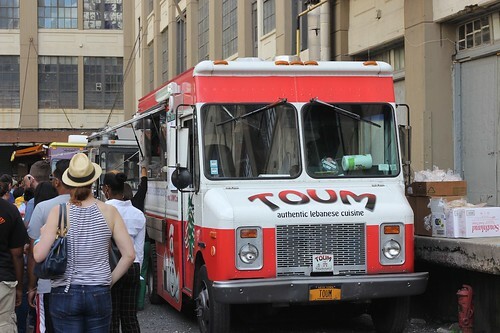 Whispers of deliciousness kept the lines at all six vendors crazy all day long. One thing I was excited to try was Cholita Cuencana’s espumilla, an Ecuadorian dessert made from egg whites, sugar and fruit. 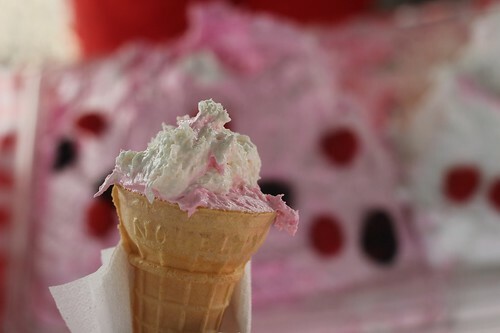 It has the texture of whipped cream, but the sweetness of meringue or American buttercream frosting–it was basically a cone of colored sugar. I loved it. 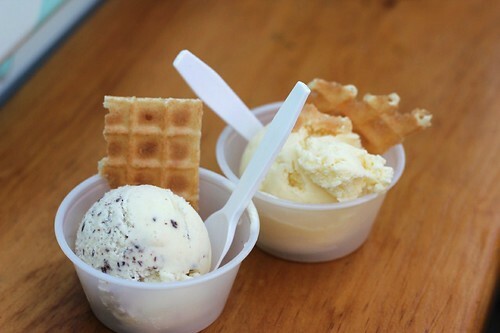 But that didn’t win out over Itizy’s Ice Cream! Their smooth, flavorful scoops beat out Oddfellows Ice Cream, Liddabit Sweets, Del’s frozen lemonade, PopItBaby, and Carpe Donut–where I maybe acquired three hot apple cider donuts. We all know that the people need to be heard when it comes to the main category, and for once, I was right on who I thought would win! 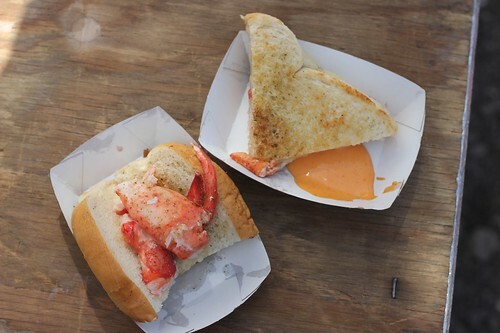 The Chipper Truck’s taco chips, King Souvlaki’s meat, The Cinnamon Snail‘s vegan delights, and El Olomega’s pupusas were all going to bow down to lobster rolls and lobster grilled cheese from Luke’s Lobster. They didn’t even need Luke’s good looks to sway the undecideds. But the judges were nearly unanimous in who would take home the Vendy Cup. 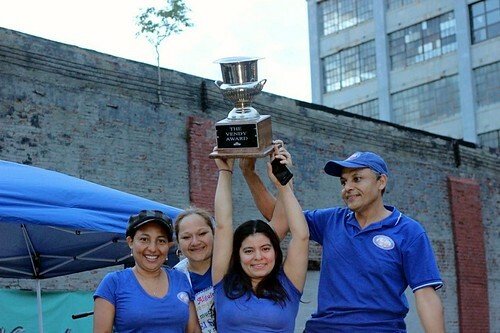 For the third year in a row, the Cup is going back to Red Hook, this time with a home on El Olomega’s truck! The Lainez family was beyond ecstatic to win the award and have already seeing the Vendy effect at the ballfields. Posted by Blondie at 8:47 am, September 9th, 2013 under Vendy Awards.